For some time now Timber has been the material of choice in both interior and exterior design circles and with good reason too. As both a building and decorative material, there's something quite unique about the effects that can be achieved with good timber. Many of the qualities that people admire in this material are due to the fact that was once a living organism, so whether someone is building something like an eco friendly home that aims to blend in with its surroundings or whether looking to achieve a warm homely feel to an interior, timber is an excellent choice for the job. The use of this material is no modern phenomenon though, wood has been used for thousands of years for a variety of roles in construction partly due to there being no short supply of trees. This can be clearly seen if we look at old architecture that has survived the test of time, timber frames and roofs are omnipresent in most buildings, particularly in historical cities such as York and Chester. Timber in its various forms is a beautiful material to work with and depending on the selection, has widely varying characteristics. It has a wide range of colours, from the reddish tinge of cedar, to the rich dark brown colouring of stained oak. It's not only the colours of wood that make it appealing though. Many people work with timber as a material because of the characteristics unique to each individual piece of wood such as its knots and grains. The knots and grains of woods are due to the characteristics of the tree it was sourced from, influenced by things such as branch position and trunk orientation. Timber makes a fantastically strong construction material because of how it is formed. The cellular structure of a tree means that it is able to withstand tremendous amounts of pressure and strain. It manages to withstand these immense forces while being relatively low density which makes it ideal for use in housing frames and doors. Not only are individual pieces of wood strong but durable items can be made by interlocking pieces that have been glued together in order to form a single sheet. Environmental impact is increasingly becoming a major concern for people involved in construction as well as with the customers who originally commission the builds. Additionally, there is increasingly more and more legislation coming in to place that places environmental restrictions on building projects. Timber as a material, can be seen as an extremely environmentally material. 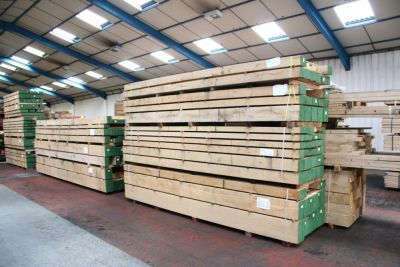 Even though it is sourced by cutting down trees, this is increasingly been carried out in an ethical way with more trees being planted than are being cut down, thus ensuring the sustainability of the material and making timber the perfect choice for construction projects.